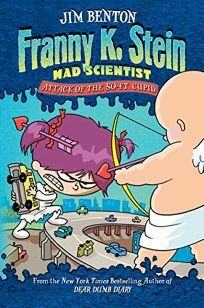 Attack of the 50-ft. Cupid picks up where Lunch Walks Among Us left off in the Franny K. Stein, Mad Scientist, series by Jim Benton. In this installment, Franny gets a lab assistant courtesy of her mother. Franny also learns about giving valentines and what it means to feel love (for her new pet at least)-but not before an all-out battle royal with Cupid, brought to life and made grossly enormous by science-gone-wrong. The book also includes a twisted valentine generator and removable cardboard valentines.